Now that the holiday season has come to a close, it’s time for ELK Studio’s annual Make It For Me Event. 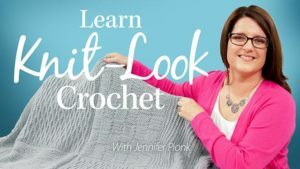 During the month of January, Kathy spotlights free crochet patterns on her blog from many of your favorite designers. 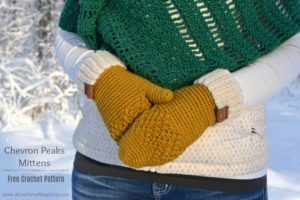 Each of these designs is a great project to make for yourself after spending countless days crocheting holiday gifts for others. Last year I designed the Chic Cabled Headwarmer, a stylish, cabled headwarmer with a button closure design that can be worn to the back or off to the side. I also designed the Chic Textures Headwarmer for those who do not like cables. 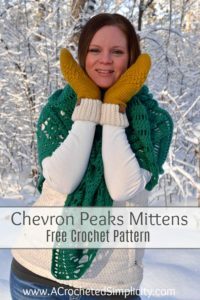 After releasing the Chevron Peaks Slouch (click here for the free crochet pattern) this past fall, I had many crocheters in the A Crocheted Simplicity Crochet Community Group on Facebook ask me to design mittens to match. I thought mittens would be the perfect project to make for this event…. I needed a smaller project to help get me back into crocheting after a busy holiday season. Yarn: Worsted Weight / 4; Lion Brand Wool Ease in Fisherman (12o yards) & Mustard (140 yards) were used for the sample shown on this page. Invisible Single Crochet 2 Together (inv sc2tog): Insert hook into the BLO of stitch indicated, insert hook into BLO of next stitch, yo, pull up a loop, yo, pull thru all loops on hook. Turning chain(s) are not included in stitch count, unless stated otherwise. Another comparable worsted weight / 4 yarn may be used as long as gauge is met. The cuff is worked flat and then seamed. The mitten is worked in continuous rounds (a spiral) from cuff to fingertip. The thumb is then added. Instructions are included to lengthen your mittens, if needed. Do not fasten off. Continue on to Body of Mitten. The entire Body of Mitten is worked in continuous rounds (also referred to as working in a spiral). I strongly suggest using a scrap piece of yarn to keep track of the beginning and ending of each round. Step 1: Turn the cuff inside out. The RS of the body of mitten will be worked on the WS of the cuff so that when the cuff is folded down, the RS is showing. Remainder of the mitten is worked using gold yarn. Sizing Tip! Try your mitten on at this point. If it is too short, pull out Rnd 15 and work 1 or more repeats of Rnd 10. Then continue on with Rnd 15. Do not fasten off. Continue on to Chevron Design. Note: Round 1 of this section begins in the skipped stitch from Rnd 16. 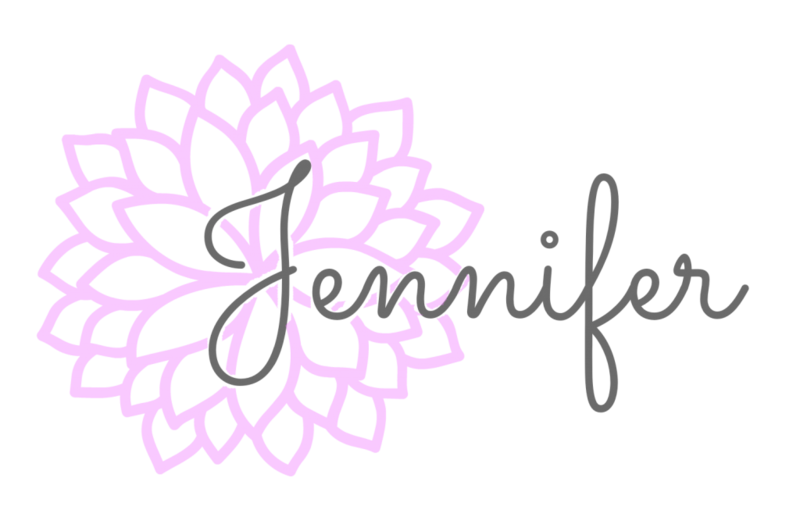 I’ve done this to help line up the chevron design. Rnd 7: Switch to a 4.00mm crochet hook, Rep Rnd 4. Do not fasten off. Continue on to Decreasing. Sizing Tip! Try your mitten on at this point. The last 4 rounds will add approximately 1″ to the length of your mitten. If you would like a longer mitten, simple repeat round 2 as many times as you’d like, then move on to round 6. Fasten off leaving a 6 – 8″ tail of yarn. Continue on to Thumb. Note: Thumb is worked in continuous rounds (spiral). I suggest using a scrap of yarn as a stitch marker to help keep track of rounds. Tip! If you’re left with a small gap at each corner of the thumb where you work into the side of the exposed sc’s, use a scrap piece of yarn and stitch the gap closed after completing Rnd 2. Fasten off leaving a 6″ tail of yarn. Continue on to Finishing. Turn mitten inside out. Using a yarn needle and yarn tails, whipstitch both the tip of the mitten and thumb closed. Weave in ends. Repeat all instructions to make the second mitten. I LOVE seeing your finished projects! Please share them with us in the A Crocheted Simplicity Crochet Community group on Facebook!